Last year, Yellowfin changed the world of business intelligence and analytics with the introduction of Yellowfin Signals. We automated data analysis, removed dashboard dependency, and sped up the process where you would get alerted to the most important changes in your business data, just ask AeroEdge. The detail that each Signal generates includes: a time series chart that traces the performance of the data metric, other existing Signals in the same time series, detailed natural language explanations of the data change, and relevancy of the specific Signal in accordance with the rest of the data. There are also options included to compare data: ‘Related’ to compare related metrics from the same data set, and ‘Correlated’ for matching with Signals from multiple data sources for the same time period which have gone through correlation analysis. This blog will be covering the different ways in which users can manage Yellowfin Signals. Certain user interactions change how the system acknowledges which Signals are relevant to you and your requirements. The system takes into account the types of Signals you are watching, have commented on, possess ownership of, and have rated as useful, so it can send you the most relevant data changes based on these interactions. Signal actions and interactions are provided to improve governance and management of important insights. Most of these are carried out by a newly included 'Actions' button added to the UI. You can see the Actions button when you view Signals in a list, or when exploring a Signal. Let’s take a look at each Signal interaction in detail. 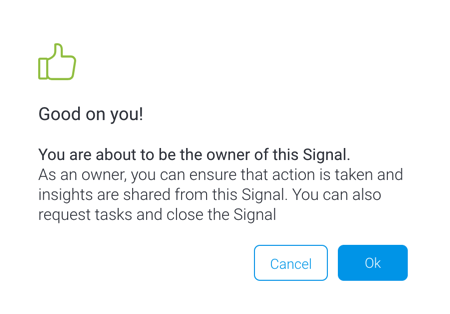 With this new feature, you can own a Signal, or assign someone to own it. As an owner, you can make sure that action is taken on the Signal, investigate and resolve any underlying issues related to it, or share it with other users. This allows you to have a single go-to person for a particularly special insight. If anyone in your organization wants feedback on further changes on an interesting Signal and how it’s progressing, the owner is the one they refer to. 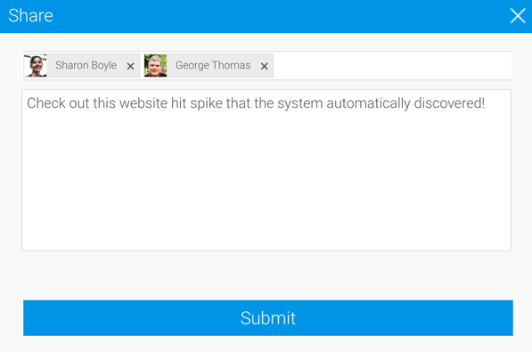 The owner’s name and profile will appear on the Signal page, making it quick and easy to identify them. 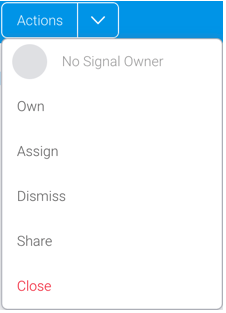 The options that have been added are different if the owner is yourself (in which case, select ‘Own’) or another user (‘Assign’ the Signal to them). If you opt to become the owner yourself, we’ll let you know about it. Unassigning yourself as the owner, or re-assigning another user to take over, is just as simple to do via the Action button. 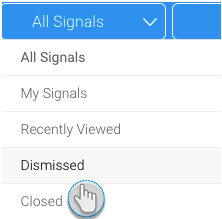 Go to the Signals List page, and set the second filter on top to either Dismissed or Closed Signals. 2. You’ll be able to see only Signals with the selected status. 3. 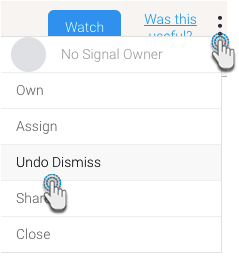 When you spot a Signal that you want to bring back to the active list, click on its ellipses button, and choose Undo Dismiss (or Open if it’s a closed Signal to bring it back for everyone). If you see an interesting Signal that you’d like to share with someone or with a peer group, then that’s exactly what you can do now. In Yellowfin 8.0.1, we’ve added the Share feature, but you need a special role function called ‘Distribute Signals’ enabled to be able to carry this out. The recipients that you share a Signal with, must have access to that Signal. That is, if they don’t have the data source or view access, or if they have access filters preventing them from viewing the data of the Signal, then they won’t be able to see this Signal. Rating a Signal prior to this Yellowfin update meant giving it a rating of up to 5 stars, depending on how important it was to you. But we decided that the star system ultimately wasn’t as helpful as we’d like - what’s the difference between 4 and 5 stars? Or 3 stars? 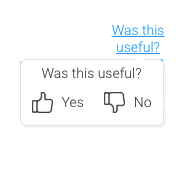 Every user had a different opinion. So we simplified the rating mechanism. Now all you need to do is specify if a Signal is useful or not, based on your preference, with a thumbs up or a thumbs down. The Signal engine will update the Signal relevancy to bring you anomalies and data changes similar to those that you find useful. You will also see less of the Signals that you deemed ‘not useful’. This is just a brief update on the Yellowfin Signals enhancements that you will experience in version 8.0.1. 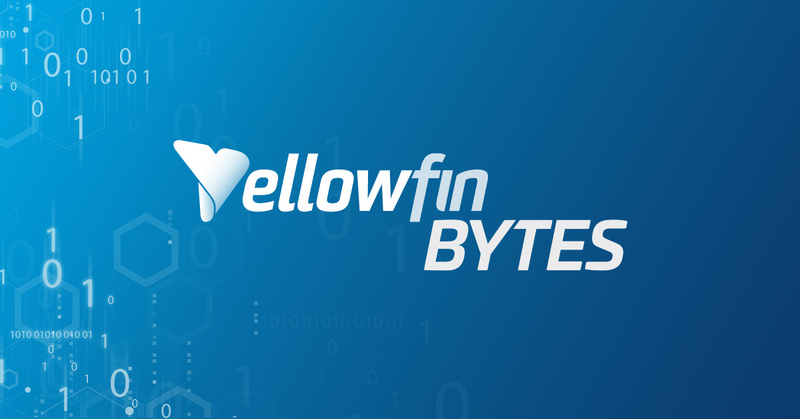 Stay tuned for more updates with Yellowfin Bytes, or read our 8.0.1 release blog for an overview of all the key enhancements. Find out more about the helpful enhancements in the latest Yellowfin release, including updates to Signals, Stories, Assisted Insights, and dashboards, in the release blog post.